I say a lot of things are the best ever, especially tacos, and I got what I wanted in Los Barriles. The guys and I pulled up to a little home front taqueria-- two tables with chairs and a counter with some stools-- and were greeted by a large, smiling hostess who took our orders and went inside to cook. 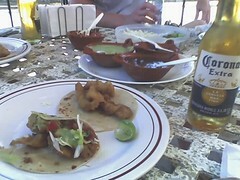 The fish was fresh and delicious, deep fried in a light batter, served on homemade corn tortillas. With the tacos came two salsas (verde and chipotle), a bowl of grilled jalapenos and onions, and fresh cabbage, cucumber, and limes. "Prefecto" was uttered more than once during lunch. Got Taco Toaster? It's the bomb!